These chili cheese fries feature spicy chorizo. You can substitute an equal amount of hamburger if you'd like to tone down the heat. Garnishes are optional. The recipe serves 4. 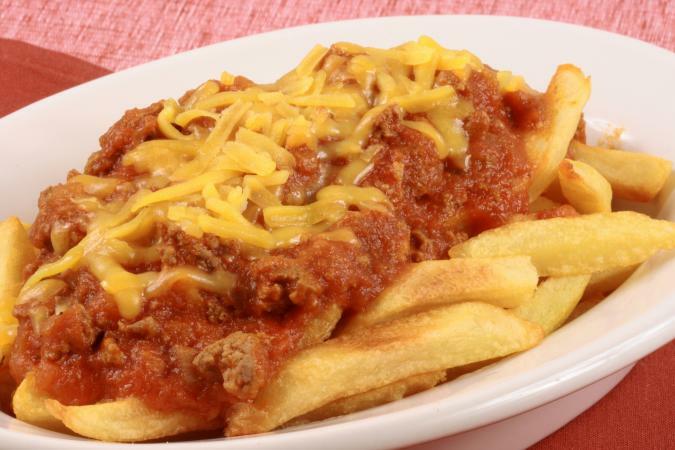 Get the chili started and then work on the fries so you have everything timed perfectly. Add the onion and green pepper and cook, stirring occasionally, until the veggies are soft, about five minutes. Add the chorizo and cook, crumbling with spoon, until it is browned, about five minutes. Add the beans, crushed tomatoes, chili powder, chipotle powder, garlic powder, onion powder, cumin, and salt. Bring to a simmer, stirring occasionally. Simmer for 15 minutes, stirring occasionally. Brush two rimmed baking sheets with two tablespoons of the oil. Preheat them in the oven for five minutes. In a large bowl, toss the potatoes with the remaining two tablespoons of oil. Put them in a single layer on the hot baking sheets. Bake in the preheated oven, turning occasionally, until the fries are crispy, about 20 minutes. Season with the salt. On four plates, arrange the potatoes. Top with the hot chili and then sprinkle with the cheese. Allow the cheese to melt naturally from the heat of the chili. Then, add any of the above optional toppings, as desired.